ALL Xamas dresses closeout priced at $ 39.99 until gone. All sales final. These figure skating dresses are perfect for figure skating practice or competitions and are available in children's and adult sizes. These figure skating dresses combine velvet, lycra and georgette materials in a variety of styles including long sleeve and sleeveless figure skating dresses. 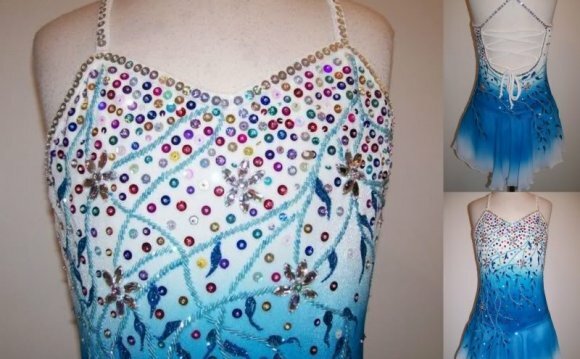 These figure skating dresses have many touches only available on much more expensive figure skating dresses, such as sequins, rhinestones and contrast stitching on the skirt edges. Many also feature two and three layer skirts of georgette and velvet for a distinct look for figure skaters. GDR074 Mint green lycra sleeveless scoop neck figure skating dress with two layer georgette over lycra skirt. Dress has sequined dangles on front. XGD041- Sleeveless lycra dress with two layer georgette skirt. Mesh scoop neck top has pink contrast stripes, some of which are adorned with rhinestones. Two layer georgette skirt has contrast hem edge. Available in 10, 12, 14, 16, small $ 39.99 XWD189 Sleeveless pink crew neck dress with diagonal black mesh bodice and crystal starburst design. Dress has 2 layer georgette skirt and hidden zipper back closure. XGD392 - Asymmetrical purple crew neck velvet dress with glitter mesh sleeve. Dress has front rhinestone decor and zipper back closure. XWD078 Red lycra crew neck long sleeve dress with black mesh overlay. Dress has hidden zipper back and freestyle skirt. Available in child 10, 12, 14 $ 39.99 GDR020 Purple glitter slinky sleeveless asymmetrical figure skating dress and round skirt with bow accent. XGD435 - Long sleeve scoop neck dress with three layer georgette skirt. Bodice is black and sliver sequined diamond pattern lycra. Long mesh sleeves and neckline is trimmed in black lycra. Three layer georgette skirt has contrast hem stitching. MDS 002 Red lycra long sleeve dress with seamless mesh upper bodice and long sleeves. Dress has lycra round skirt. Full front lining. MDS001 White lycra long sleeve dress with seamless mesh upper bodice and long sleeves. Dress has lycra round skirt. Full front lining. MDS001 Black lycra long sleeve dress with seamless mesh upper bodice and long sleeves. Dress has lycra round skirt. Full front lining. XGD088 White glitter velvet dress with double layer georgette skirt and handkerchief sleeves. GDR095 Red lycra dress with white trim and double georgette skirt. Long sleeves have two layer bell cuffs and cuff and skirt edges have contrast stitching. Hidden zipper back. Dress is adorned with rhinestones as shown.